For Better - Or What? : I'm Ba-ack! I stopped blogging in April and May so that I could devote my time to the final semester of my Master's degree program in Linguistics. It was necessary to spend many hours every day completing my last class, writing those last few papers, and studying for the comprehensive exam. The good news is that the hard work paid off and I received my degree at the end of May. 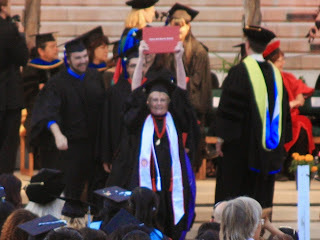 As the accompanying photo shows, I was very happy to get that diploma! Congratulations to all my fellow Linguistics graduates. What a delight it has been to travel this road with you. And thanks to the dedicated professors who encouraged us and drove us crazy, all the while rooting for our success. Despite our resistance, you turned us into master linguists. Very special thanks and love to my husband for being so completely supportive of my goal. At long last, school is over -- but it isn't really over. I expect to begin teaching this summer. It will be wonderful to view the classroom from the other direction. Congratulations! I like the triumphant pose. Rosemary!!! Congratulations and BRAVO!!!! I hope you find time to celebrate and take it a bit easy before your teaching begins.